Who is mission valley chorus? 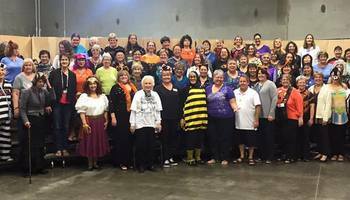 Mission Valley Chorus is a group of women singers with a rich history spanning over 50 years of history as a chapter of Sweet Adelines International Region 12. Our dedication to harmony, and to our Director Angela Suraci, and to each other shapes the chorus as we make music together. We love to learn, sing, compete, and perform our four-part a cappella harmony, and we love to do all those things while having fun! All our rehearsals are open to the public and to potential new members, so why not pay us a visit. Did we mention that we are a little quirky? You never know what will happen next at our fun filled rehearsals. Guarantee: You will leave the hall grinning, sweating, and humming one of our favorite songs! We rehearse every Tuesday evening at 7:30pm, at Nordahl Hall, 580 W Parr, Los Gatos, CA 95032. Want Mission Valley Chorus to sing at your next function? 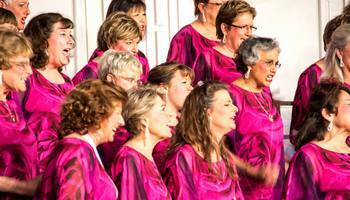 Why not hire Mission Valley Chorus to entertain at your next event? We can perform at corporate functions, charity events, community Entertainment events, birthday parties, christmas parties, awards nights, weddings, engagements, anniversaries, engagements, and even funerals and memorial services.